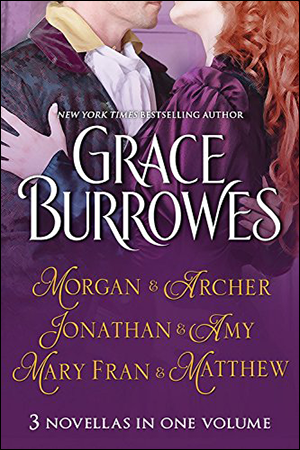 This sparkling short story ties back to Grace Burrowes’ popular Windham series with characters introduced in The Virtuoso and Lady Maggie’s Secret Scandal. Archer Portmaine is investigating a plot against the Crown when he meets Morgan James, a young lady who believes her hearing problems make her a poor candidate for marriage, although her disability provides the key to unraveling Archer’s mystery―and to capturing his heart. In Lady Eve’s Indiscretion, the Marquis of Deene wanted to wrest custody of his niece Georgina from her wealthy Irish father, widower Jonathan Dolan. Now Jonathan needs Deene’s assistance to help him woo Miss Amy Ingraham, Georgina’s proper, pretty governess. Jonathan must be clever, determined, and above all else honorable if he’s to win not only Amy’s hand, but the respect of a society only too willing to judge him harshly. In The Bridegroom Wore Plaid, three of the MacGregor brothers found true love, while their widowed sister, Lady Mary Frances MacGregor, met her match in Matthew Daniels. Mary Frances has vowed she’ll never succumb to manipulation by another handsome Englishman, but falls hard for lonely, outcast Matthew Daniels. But Matthew has a scandal in his past, and his conscience forbids him to persuade Mary Frances to marry him.